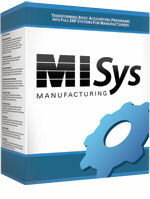 Click here to get a free trial of the Sage 50 Quantum addon MISys Manufacturing. It only takes minutes to download the brochure, get the fact sheets, watch the demo videos, generate a price estimate, review the ROI analysis and download the free trial. Sage 50 Quantum Manufacturing Edition 2019 streamlines your business and gets everyone working together as one team! Sage 50 Quantum Manufacturing 2019* is the ultimate, high-performance Sage 50 accounting solution that's designed to meet your changing needs with features that help improve internal communications and collaboration; provide better, faster customer service; and keep information secure. MISys Small Business Manufacturing pays for itself by helping you reduce your inventory holding costs, avoid painful purchasing mistakes, and prevent costly production delays. No other manufacturing system offers such dramatic return on your investment.